On a misty Friday morning, eighteen players and their parents departed for the trip to play in the annual Bournemouth Festival. This was the first tour for this age group and they had high hopes of a fun trip. What we hadn’t told them just yet was that it was a 7.45am leave the following day! Still a swimming pool, arcade and some food seemed to keep them occupied that evening. 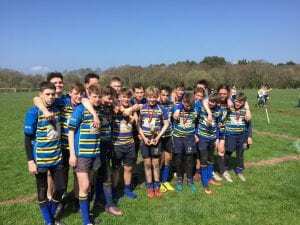 Amazingly 18 boys appeared ready and on time, if not bright eyed to take the 30 minute trip from Sandford Holiday Park to Bournemouth rugby club. The boys were focussed and ready which in all honesty is not always the case at that time of the morning for their first game of the day at 10am. The format was 3 group games with the winner of the group proceeding to the final. The first game was against Ellingham and Ringwood. A great performance saw Thanet win comfortably 6-0. The style of play and attitude of the boys was fantastic. Some of the offloading and attacking play would not have looked out of place with players several years older, the space created and the execution of passing was a pleasure to watch. Following a brief rest the next game was v Liverpool St Helens, this was the first time some of our boys had played a team from so far away, I think a couple even thought they didn’t speak English! Another great performance saw Thanet run in 4 tries without a response to win the game 4-0. This was particularly pleasing as LSH did have some giant players however Thanets defence was strong and organised. So the last game against Haslemere would decide if Thanet progressed to the tournament final. An outstanding performance saw them cruise to victory 4-0 showing patterns of play and determination that were a joy to behold. Confidence grew and grew through the group games and the belief that the team had was only punctured slightly when we found out we were playing Bournemouth in the final with their two Behemoths playing at prop. After some direction from the coaches and a many sweets and drink Thanet took the field. In an amazing game Thanet scored two wonderful tries the second of which involved moving the ball from inside their 22m line going through at least 10 pairs of hands and outpacing the home defence to touch down. 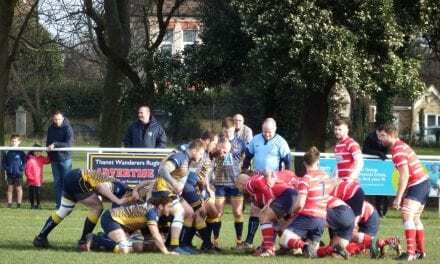 At 2-0 up it still wasn’t comfortable Bournemouth had a strong side and used their greater size to score the first try against Thanet in the competition just before half time. With the players determined to fight the second half was a backs to the wall defensive effort with only a few opportunities to break out of Thanets half. Eventually the defensive wall was breached and a second try was scored as one of the Bournemouth props crashed over. With just seconds remaining Thanet gave away a penalty , which fortunately missed touch and went out of a Thanet hand. The final was over 2-2. Some careful checking of the rules meant that as Thanet had scored the first try in the final they were winners. The Thanet boys punched the air in celebration, jumped around hugged each other and generally belied the effort and hard work they had put in over the 4 games to become the Festival winners. A great team performance was celebrated with a team meal and in the traditional rugby way. Thanet U14s can be truly proud of the way they played and behaved over the whole weekend, they are also very proud to be joining the long tradition of becoming Thanet Wanderers.